The 2018 Toyota Prius c is made for big-city driving. It is nimble, fuel efficient and easy to park, and it comes with innovations that win awards. Toyota just made the Prius c even better for city driving. They gave it a low centre of gravity and a 9.6-metre turning radius, which makes it easy to zip in and out of parking places, not to mention easier to manoeuvre a U-turn. Of course, fuel efficiency is one of the biggest reasons to put a Prius in your garage, and the 2018 Prius c gets 5.1 L/100km combined thanks, in part, to the hybrid system’s 99 horsepower. That fuel savings is due to the Prius’ Hybrid Synergy Drive that revolves around a 1.5L Atkinson 4-cylinder motor which is equipped with an exhaust heat recovery system, as well as other performance-savvy systems. For instance, the VVT with intelligence works with the timing to produce engine efficiency. The Prius c doesn’t feel like a hybrid when you accelerate. Its continuously variable transmission makes shifting between gears smooth and quick. While it might be built for city driving, the Prius c is certainly no stranger to the highway. With the money you save on fuel consumption, think of all of the extra places you can drive. Plus, you get a cargo hold that is capable of carrying 484 litres of luggage, backpacks and other gear. The liftgate makes it easy to access the space behind the seats and a 60/40 split-rear seat lets you carry oversized pieces like golf clubs. That liftgate is an award winner, too. Because it is designed with carbon fibre inner panels, it is lightweight and got Toyota recognised with the Altair Enlighten Award for weight reduction in a closure system. By using carbon fibre rather than aluminium, Toyota was able to reduce the weight by 40 percent, and this significantly improved the battery life of the Prius. Even though the hybrid system is capable of delivering the most savings, you can help it become more productive by monitoring its performance. Toyota put an energy monitor on the dash that allows you to see real-time results so you can make driving decisions that will optimise that performance. The Prius c gives you drive mode choices, as well. Pick the EV mode if you are travelling under 40 km/h, or choose the ECO mode to save fuel. The ECO mode makes adjustments to the climate control and the throttle in order to get those savings. As part of Toyota’s commitment to safety, they have equipped the Prius c with an array of safety features that include things like a Pre-Collision System, Lane Departure Alerts and Automatic High Beams. This Toyota Safety Sense™ package is standard on both Prius c models. 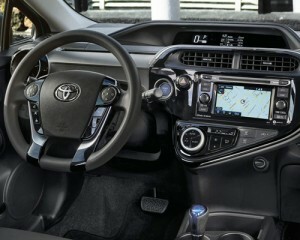 In addition, Toyota equipped the Prius c with a backup camera on all models. 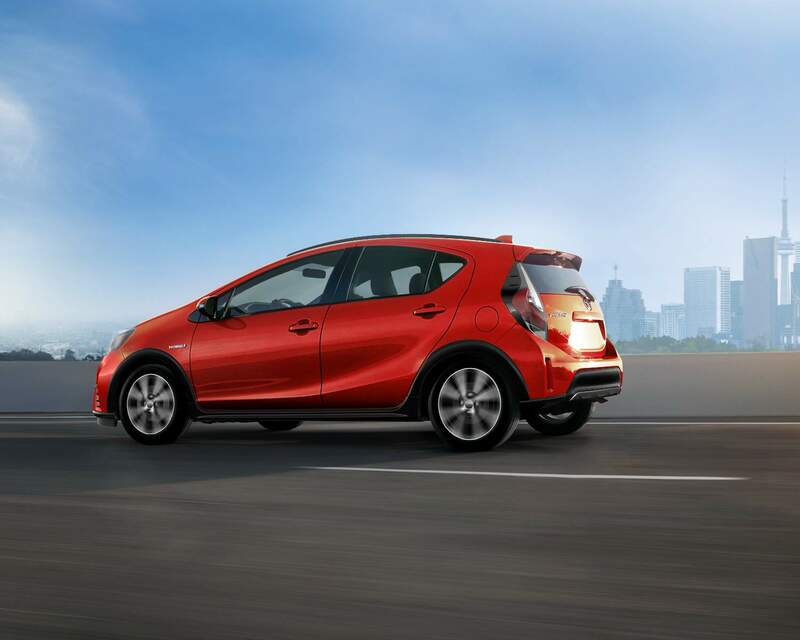 The Prius c is filled with technology that is designed to make your drive more comfortable. Bluetooth® connectivity allows you to make hands-free calls, and the available Upgrade Package boosts the audio system to six speakers along with convenience features like an adjustable seat cushion on the driver’s seat. In order to appreciate fully its manoeuvrability, the 2018 Toyota Prius c must be driven, and we have one ready for you to test drive. It might be small, but it is big in ideas. Come by today.